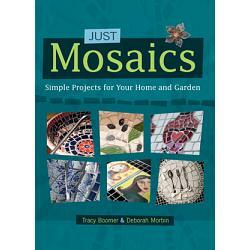 JUST MOSAICS SIMPLE PROJECTS FOR YOUR HOME AND GARDEN by TRACY BOOMER AND DEBORAH MORBIN. 128 pages . Paperback. 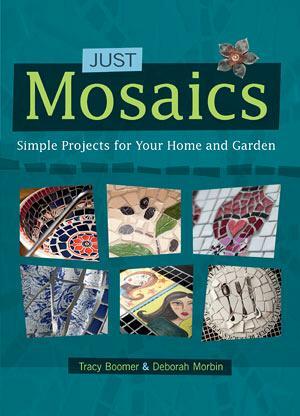 Featuring step-by-step instructions for creating beautiful decorative mosaics, this guide will help anybody looking for a creative way to add art and color to their home. It begins with the basics, such as picking tiles and choosing the correct tools, and continues through the completion of projects, which range in difficulty and include items such as a hexagonal tray, a scrapbook bin, a mini chest of drawers, and even a bird bath. The lessons are expertly taught and explained with detailed instructions and helpful hints, so crafters can successfully reproduce the projects or use them as a basis for their own ideas.